This piece of paper is 8 1/2" x 11". Although the scan shows it as white, it's actually a grayish/off-white. It has no watermark and is a fairly low-quality paper. It was folded in thirds as to be placed in a business envelope, and then in thirds again; I flattened it out as well as possible. The information on it is almost all typed, save for a few handwritten comments/corrections in the Remarks column. 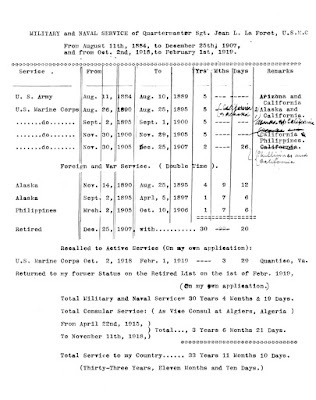 This is Jean La Forêt's compilation of the details of his military service in the United States. As he wrote in his journals, he was in the Army for exactly five years. Barely a year later, the siren call of military life called him back, and he enlisted in the Marine Corps. His breakdown of his enlistment periods on this sheet gives a little more detail about some of the gaps in his journal. Here Jean wrote that his first tour in the Marines ended August 25, 1895, with the second starting September 2, 1895. In his journal, he went straight from January 15, 1892 to April 5, 1897, so there was no way to tell that he had taken a week off. The other dates Jean listed match up with what he wrote in his journal. We have read that he joined the Army on August 11, 1884. He left the Army on August 10, 1889 and a little over a year later, on August 26, 1890, enlisted in the Marines at Mare Island. There were no gaps between Jean's second, third, and fourth tours with the Marines. And in the last part of his journal he recorded that his last day in the Marines was December 25 (Christmas! ), 1907. Other dates correlate as well (maybe Jean used his journal when he put this list together). He wrote that he arrived in Sitka, Alaska on November 14, 1890 and left on April 5, 1897. (So the week between his first and second tours fell during his time in Alaska. Did he stick around and enjoy the end of the summer?) Similarly, his arrival and departure dates from the Philippines match exactly those in his journal. Because Jean was so thorough, we now know his dates of service in the Marines for World War I, including his notes that he was both recalled to active service and returned to the retired list on his own application. 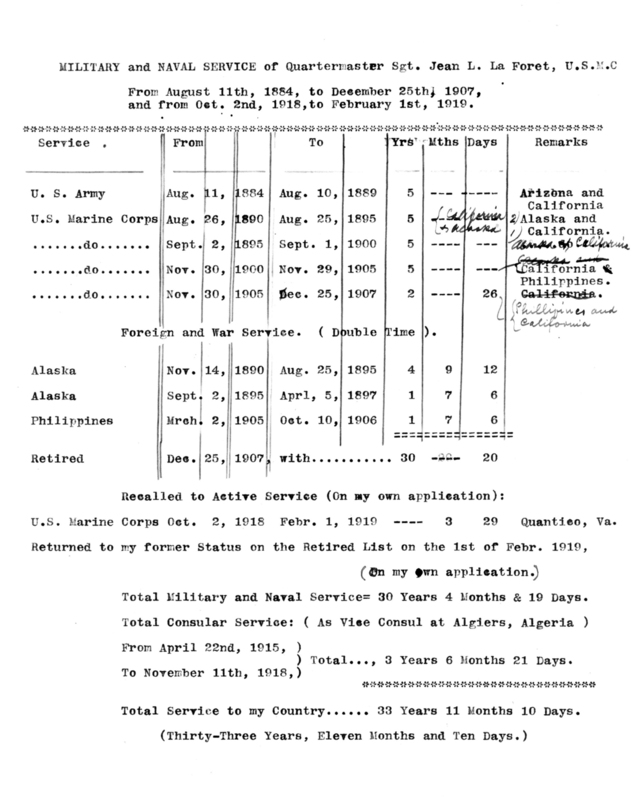 Jean also included the dates for his service as a Vice Consul in Algiers. There's a small conflict with his World War I Marine service, however. He said he re-entered the Marine Corps on October 2, 1918, but that he left the Consular Service on November 11, 1918. Does that mean for five weeks he was an active Marine and a Vice Consul at the same time? I do find it interesting that his position as Vice Consul ended on Armistice Day. I am confused by Jean's inclusion of his time in Alaska in "Foreign and War Service", for which he would earn double credit toward retirement. The United States purchased Alaska in 1867, well before Jean's arrival there in 1890. From 1884 to 1912 it was officially the District of Alaska. 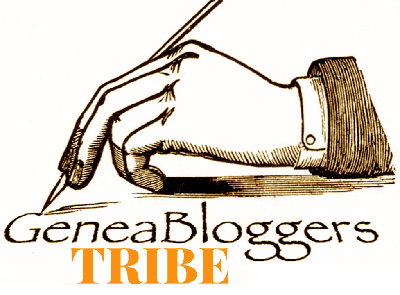 Does the designation of "district" connote foreign territory? I can't find anything online about a war of any type taking place in Alaska between 1890–1897. The Yukon gold rush began in 1896, but that wasn't a war (and actually wasn't in Alaska, even though many miners went to the latter). Jean wrote almost no details about his time in Alaska in his journal, the only exception being when he moved into new barracks in 1892. On the other hand, this was Jean's write-up; just because he classified Alaska as foreign service doesn't mean the U.S. government did. Jean called his service military and naval. Emma also made that distinction when applying for a pension based on his service, when she declared that her first husband, Emile Petit, had never served in the U.S. military or naval service. I'm still confused by the inference that the Navy isn't military, and I'm sure a lot of people in the Navy and Marines would be also.